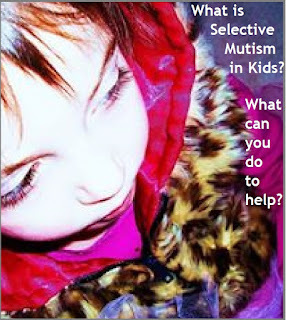 Heartfelt Balance Handmade Life: What is Selective Mutism in Kids? What is Selective Mutism in Kids? There are a few children that seem to enjoy spending time alone, lost in their own world of play. It is not unhealthy behavior until it becomes the norm for them to do this in nearly all social situations. It is true that some children are naturally more shy than others, but it should never be at a point that all social interactions are awkward from start to finish. Why Is My Child Socially Shy? It is not unusual for a child to become suddenly shy around strangers. Some children are more prone to shyness than others. Most will come around and get comfortable after a few minutes of observing the interactions of others. There are a few children that struggle more than normal and can become almost paralyzed in fear with new, or active social situations. The main cause is a high level of anxiety. Social anxiety can become a life-long struggle for an individual if it not addressed early. What Causes Social Anxiety In Children? A genetic predisposition to anxiety is often the cause of social anxiety in children. If a parent, grandparent, or other close relative suffers from anxiety, your child is at greater risk of this same condition. There may be other factors involved, such as peer bullying, learning disabilities, or subtle speech abnormalities they are made aware of in not-so-gentle ways by others. A true anxiety condition in children should be treated seriously and all measures taken to help them learn positive coping skills. Learning disabilities of all types can cause high levels of stress and anxiety in children. They are able to pick up on frustration levels in adults and other peers and it cause them to go into a mute status. Selective mutism is a condition in which the child chooses to go silent for periods of time, mainly during heavy social activities. There are some children that are bothered by bright lights, loud noises or a flurry of activity. This can cause them to self-isolate and refuse to take part in group activities. Problems with phonetics, word usage, word and sound formation, or slowed speech can all increase childhood anxiety and cause them to hide away in a shell. The problem can be made worse by having these abnormalities pointed out. The child is unable to perform to expectations and consequently shuts down socially. You will notice that in a more comfortable and intimate surrounding, they open up again and get highly involved. There is available speech therapy for children that can help them gain the confidence and skills needed to combat social anxiety. The methods are as varied as the individual needs of the child. A quality speech therapist will conduct the proper testing and design a routine that builds a trusting relationship with the child. This is when true progress can be made, with the child feeling much more confident in their own abilities. You will see a marked decrease in periods of isolation, muteness, tantrums and other negative acting out behaviors. If your child is struggling with social situations and they seem to completely shut down, it might be time to investigate whether they are suffering from social anxiety and selective mutism. Professional speech therapists, like the ones at Southwest Kids Clinic, will help your child reach their full potential.